Elafonissi has been awarded as one of the Top Beaches in the World (9th place) for 2017!! No need for a description! Crystal clear waters with splashes of pink coral on the shore. 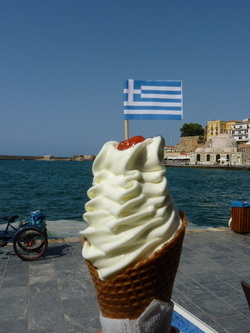 PapaGeorge located on the Chania Harbour front, has the best soft serve ice cream, thick & creamy. You can even get it dipped in chocolate! Goody's also has a creamy smaller cone for just a Euro! This Blue Flag beach is one that shouldn't be missed! Beautiful clear water, plenty of space. 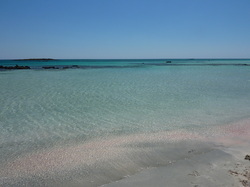 There is a large beach and several smaller beaches at Falassarna. Canteens & tavernas nearby. Sunbeds & umbrellas to rent. When on the back roads of Crete, it is easy to navigate where you want to go. Just look out for the goats on the road! 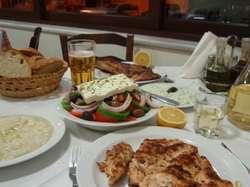 When out in a taverna, put all the food in the middle of the table so you can try it all- Greek family style! This old Turkish bath now houses one of the best tavernas in Chania. 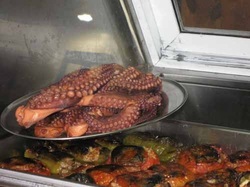 Great mezes & highly recommended in several guide books. Find fresh fish, meats & other local products in the covered market. Plus, some interesting eating places where you can choose your food & enjoy it while people watching. One thing you have to do is wander the back streets of Chania Old Town. Interesting shops, historical buildings, some of the best little eating places are in these back streets. Definitely watch the sunset, no matter where you are on Crete, they are beautiful. what the "White Mountains" turn pink as the sun dips down in the west. Shower off before & after swimming in a pool. ​Don't lather up with suntan oil & then jump in a pool, the oil will make a film on the water's edge.